I had mentioned in one of my previous post about the love for bread sticks by the Thomas family. 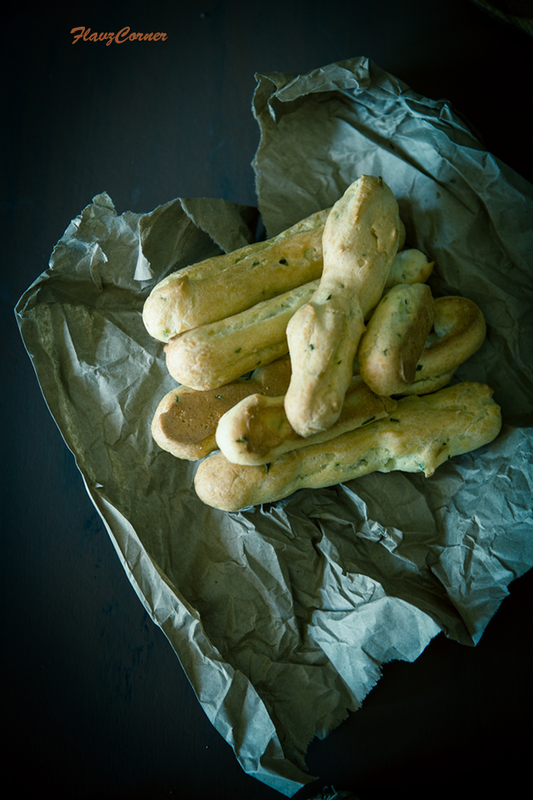 We love them to the core especially when its garlic-herb bread sticks. I had posted a recipe earlier to make the easy version of break sticks. I don't have enough bread recipes in my repertoire and on my blog, so my intent is to do more trials on breads. So I tried out another bread sticks from a recipe book last week and they came out super puffy and flaky and they were like the melt in mouth kind of bread sticks those resemble the ones we get in the restaurants. The eggs and butter gives the puffy and hollow texture to these bread sticks. 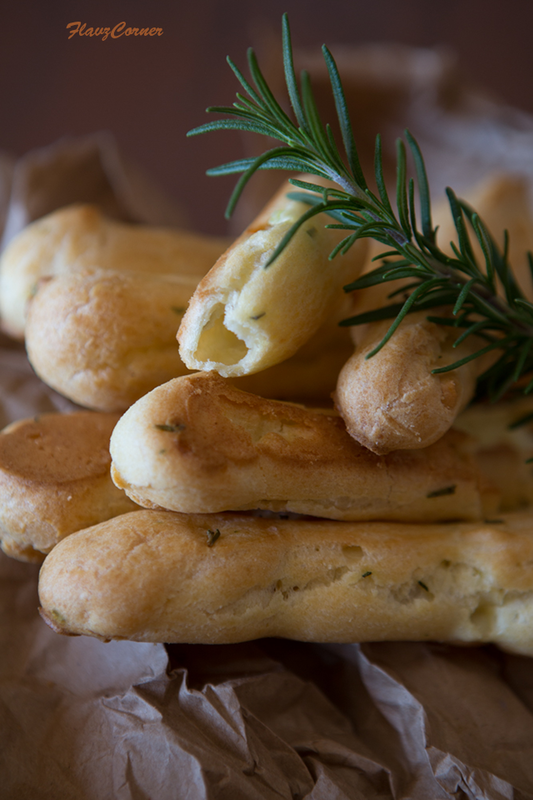 Garlic and fresh rosemary plays the vital role in enhancing the flavor of this bread sticks. Everyone in my family loved it and the only complaint they had was why I didn't double the recipe :(. I didn’t get to take pictures of the dough since it was a last minute decision to blog about this since the results were approved by my family. I am glad that this quick and easy recipe became a keeper. Pull up your sleeves and make this quick and easy bread sticks that doesn't use any leavening agents and can be prepared under 40 minutes. Serve them with a bowl of piping hot creamy tomato carrot soup and trust me your family will love it. It’s apt for the cold evenings. So are you ready to do some easy baking for dinner tonight? 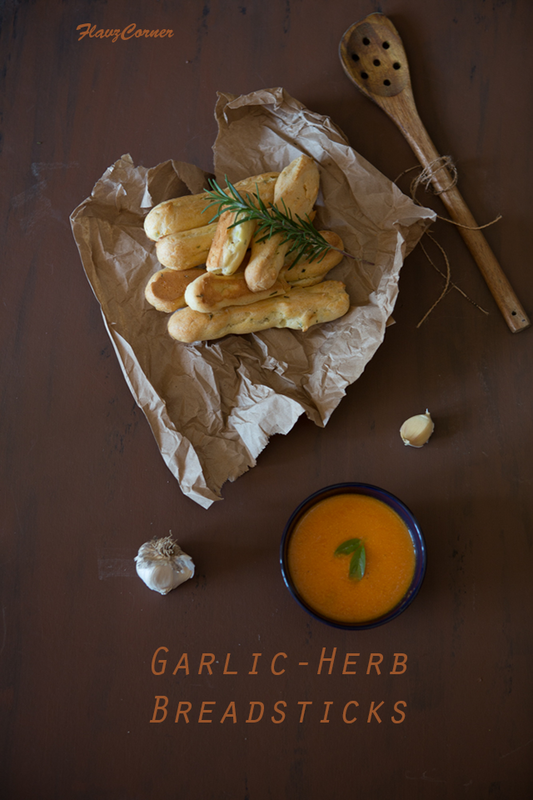 I recommend trying these bread sticks with the creamy tomato carrot soup because I think that is the perfect combination and you cannot go wrong with both of the recipes. In a heavy bottom sauce pan bring the water and butter to a rolling boiling stage. Adjust the flame to the lowest temperature. Add flour, salt, garlic and rosemary to the water butter mixture. Using a wooden spoon stir continuously till the mix forms a ball. Turn off the flame and leave it to cool for 5 minutes. Add one egg at a time to the dough ball and stir continuously to incorporate it completely into the dough. The texture of the dough will become loose and crumbled, but keep stirring till it forms the ball again. Cool it for another 5 minutes. Fill the dough into a heavy duty ziplock bag and seal. Cut the tip to form a finger sized hole. Squeeze the dough to form equally sized log shaped bread sticks on a greased baking sheet. Bake it for 20-25 minutes till they puff up and attains golden yellow brown on the top. Enjoy them with a bowl of warm soup. You can also use a piping bag with big round tip instead of a ziplock bag to pipe the dough into log shaped bread sticks. These bread sticks will puff up and the hollow shaped bread sticks are very delicate and they tastes awesome when served fresh. You can brush the top with melted butter and sprinkle with some sea salt and fresh rosemary before you serve them. Wooow bread sticks without yeast and still has hollow inside, very interesting recipe Shibi. Quick and delicious! They would be a hit in our house too. I'm a real sucker for rosemary in baked goods. Its flavor adds so much. And garlic, too -- can't live without it! These are wonderful breadsticks -- thanks.